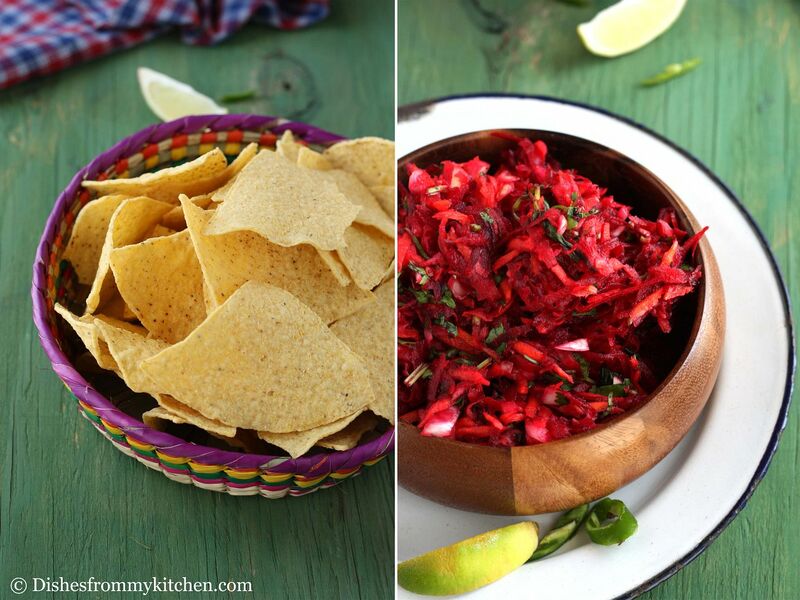 Dishesfrommykitchen: BEETS TOPPING/SALAD FOR ANY KIND OF SNACKS !!! 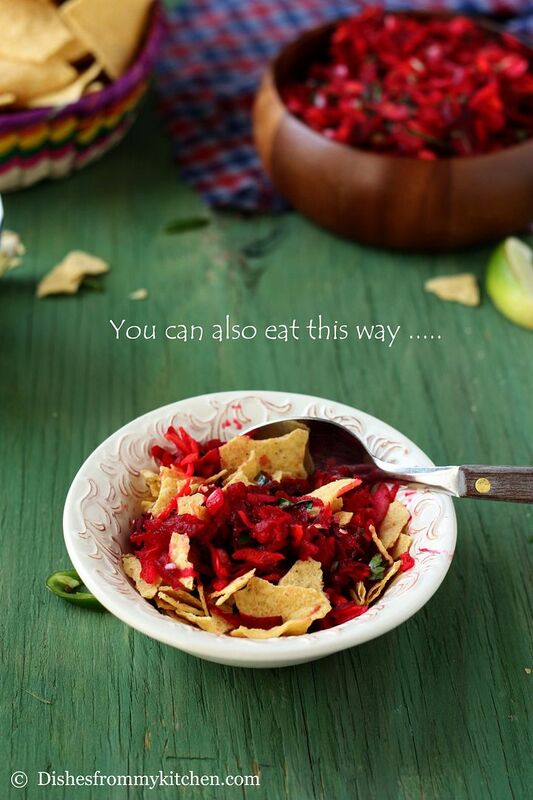 This beet salad/topping is wonderful and healthy one that goes with any kind of snacks like crackers, tortilla chips etc. 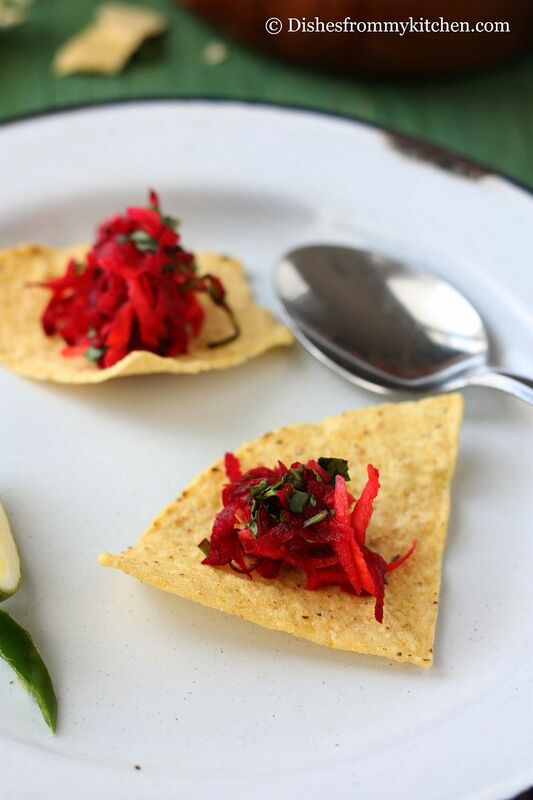 Sweet beets and carrots with the crunchy onion and fresh cilantro together with freshly squeezed lime with the hint of little spice, don't they sound tasty for the topping.. Yes they do. If you have not tried this combination try it out; for sure you will like this. 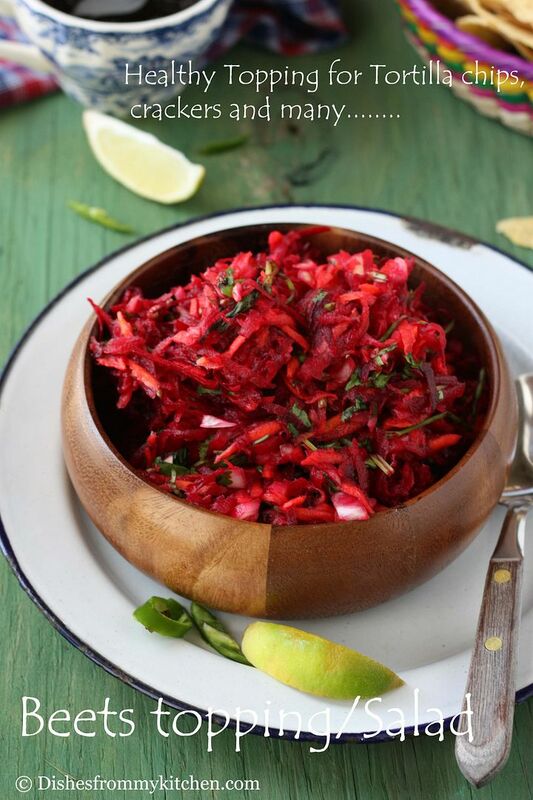 I use this salad to top so many south Indian munchies too :) I love this salad a lot... it’s a great way to include beets in your diet. Here is another way to enjoy this Salad - Click here to see How it can be used ???? 1. Grate the beets and carrots. 2. 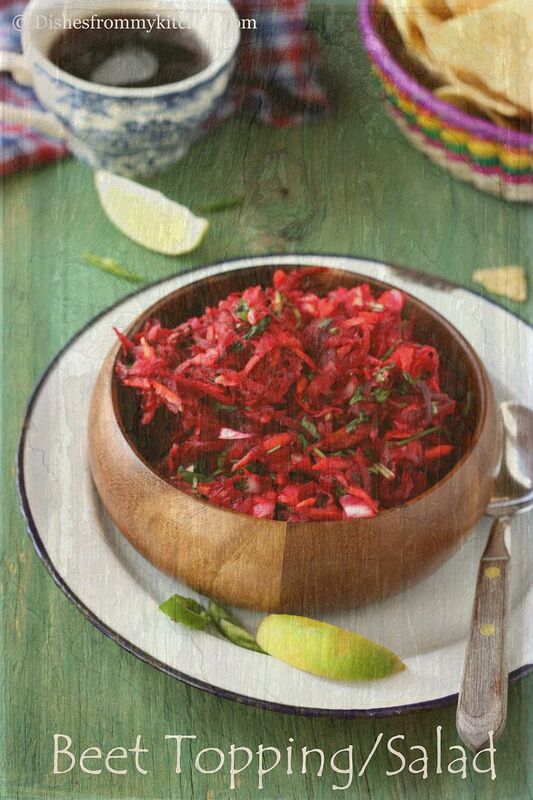 Take the grated beets, carrots, cilantro, chopped onion, chilli in a bowl. 3. Add salt and freshly squeezed lemon. 4. Mix everything until everything is blended well. 5. You can use it immediately or keep it aside for an hour. 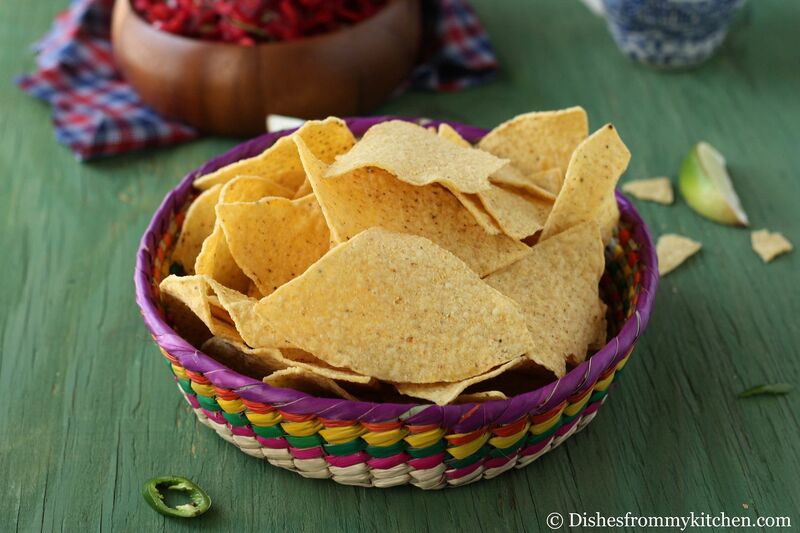 Enjoy with your favorite snack as topping or as a salad !!! See the pictures for serving suggestion. 1. You can refrigerate this salad for 2 days. I love this topping :) I have a post in my blog using this as stuffing it into the ring vadam and also used it for a topping for billalu. I like it on Thattai's!! Try that with grated raw mango and a pinch of chat masala. I love it...very popular street food in Salem TN. I just love beetroot. And it looks delicious. I like the special effects to the pictures. 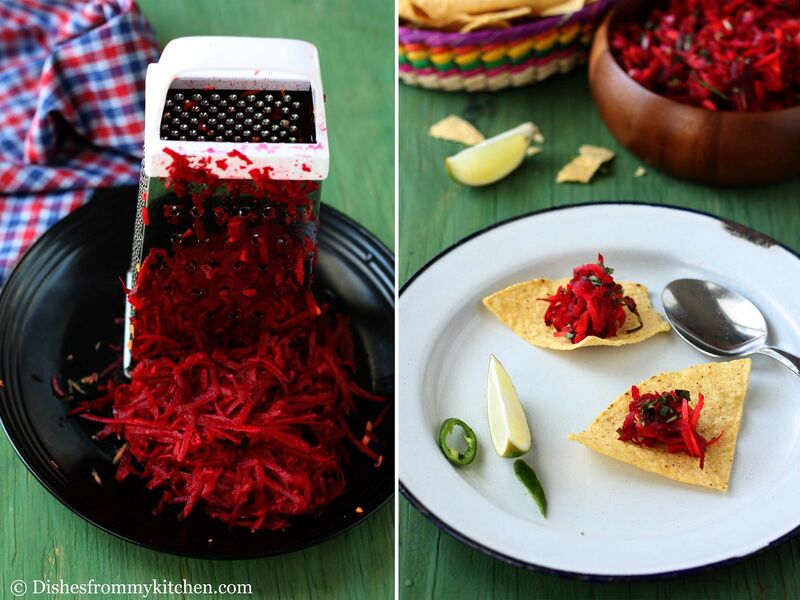 Nice way to sneak in beets.. 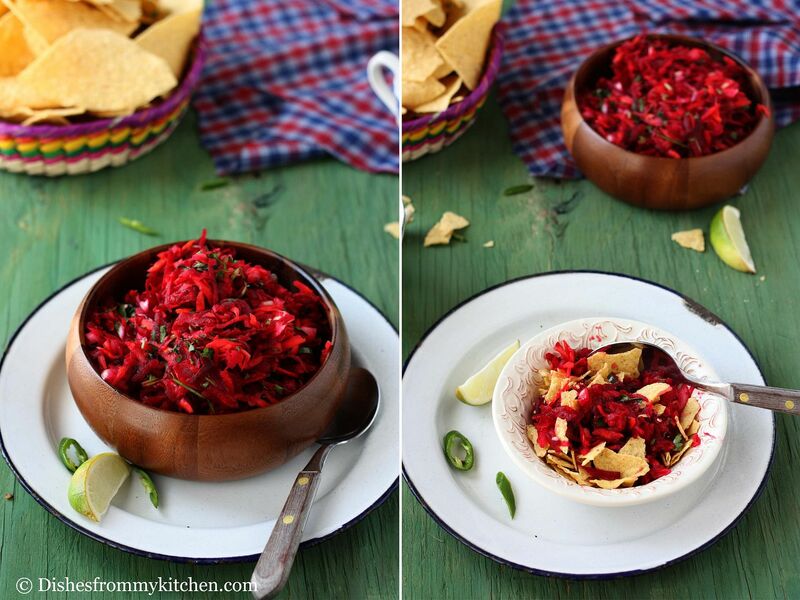 Excellent and best way to sneak beets, yummy topping. Nice healthy salad! looks very colorful I used to make only the carrots this way. Never tried beets. 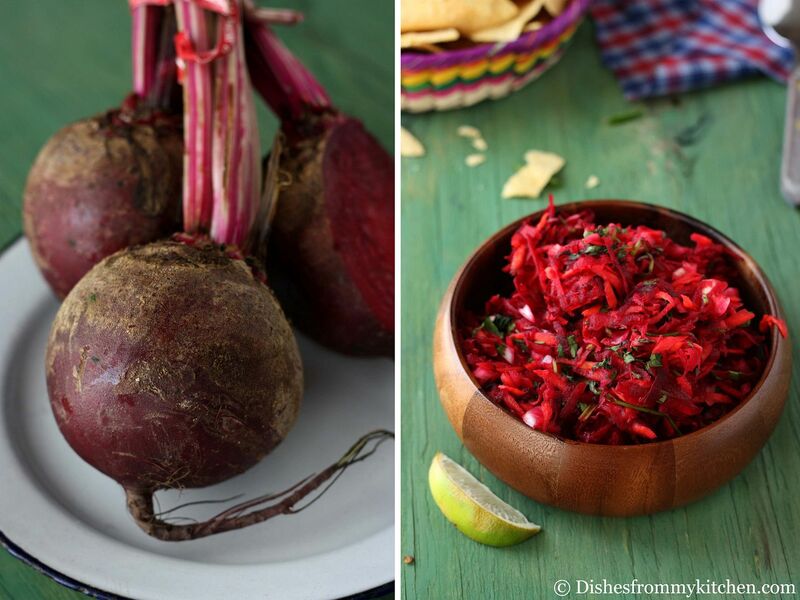 WOnderful salad pavi, never thought beets could be eaten raw in salads... lovely clicks as always. what clarity!